Amir was born and grew up in Bosnian capital of Sarajevo. He is journalist, writer and Balkan history tour guide. His current life and work/job, together with place of living, is a bit complicated to explain, so that would be left for the near future, when it gets more clear. Peaceful religious coexistence is not a utopia as some modernists and some atheists are trying to prove. Secularism is not the only solution for the peace and cooperation between followers of different religions or different personal faiths, various ways of life, creeds. Special focus is on Islam and/or Muslims, and how much religious coexistence is possible in this “field,” or how much cooperation in general, in recent years. Especially in the post-war places, or zones with some level of tension between people. The region of the Balkans and small but traditionally multi-religious country of Bosnia, are known by brutal wars, aggression and also genocide, but there are so many examples of the peaceful and fruitful cooperation, friendship, and coordination between members and followers of various faiths over there. This may seem like a standard statement of any Muslim scholar, or could be a line taken from an Islamic book… but these words actually came from the Eastern-Orthodox Church priest, Milan Radulović. He is a priest of the Bulgarian-Orthodox Church, and at the same time, he is a teacher of Islamic philosophy at the University of Ontario. This statement, given publicly last year, to one Bosnian info web portal, has been shared by many Facebook profiles and more news web portals from the Balkan area, mainly ex-Yugoslavia. Radulović has said that he is still a priest, a follower of the Eastern Orthodox teachings and not giving up on that. He emphasized that one of his best friends and colleagues is Bosnian Imam Suleiman Bugari who was popular in the Balkan area for his successful spiritual healing treatments of many drug-addicts and alcoholics. Meanwhile in Serbia, a predominantly Eastern-Orthodox nation, some Serb nationalists mistakenly thought that Milan was a Serb, because his name and surname both sound more Serbian than Bulgarian. Still, only a few people reacted online. Some of them sustained from deeper comments about him but some of them were naming him “a Serb traitor” or someone who perhaps doesn’t know what is he talking about, saying that he can’t an be an active priest anymore, because he is teaching Islamic philosophy. It’s tragic and funny at the same time, that such words are coming from Serbia more than from Bulgaria. But why Serbia? One of the possible reasons is that the Serbian Orthodox Church is still a controversial institution, and still affected by nationalism which culminated after the Yugoslav wars in the 1990s. However, things are not black and white even in this institution, regardless of its past and present. Serbian Orthodox priest Milorad Golijan, from the Bosnian town of Vlasenica, lived and worked there by the beginning of the military attack on Bosnia, in April 1992. He knew two imams from the local Islamic community, in the same neighborhood, for years. This town was taken by the most radical Serb nationalist army units, together with paramilitaries, back in 1992. In the process of Muslim cleansing of Vlasenica, these units wanted to kill two imams. At first, Imams were under house arrest, where they could make a phone call to the priest Milorad Golijan, the only person they could call for help at that time. After the phone call, Golijan immediately went to help those imams. Their names are Bego Selimović and Munib Ahmetović. Golijan took them out of house prison, using his authority as the main local priest. He managed to save imams from being executed, but they still had to leave the town, so Milorad made sure they safely arrived outside of the Serb army zone. Upon his return to home, local Serb militia made his life a living hell. The priest was publicly insulted on the streets, on the phone, and many local Serbs refused to go to his church service. He even received death threats. ; they called him a traitor. This lasted for several months, until he got sick if such an atmosphere and had to leave the town of Vlasenica. In today’s Bosnia, there is a current example of both spontaneous and planned religious coexistence, not only in having a coffee and chat together but also in charity and humanitarian actions. In different parts of the country, there is significant poverty. Hijabi Muslimah and female Islamic scholar Šeila Mujić Kevrić, and Catholic nun Blanka Jeličić, are working together in helping people in need, regardless of their faith, nationality or creed. Recently they organized a food supply for a family that belongs to the Serb Orthodox tradition, parents with five children without income and enough food for their children. Interestingly, some secular media are saying that nuns or hijabi women are usually inactive, staying at home or in convents and monasteries, but Šeila and Blanka proved the opposite. Such claims are mostly coming from the people (mainly aggressive atheists) who don’t like covered girls or women, regardless of whether they are Muslims or Christians. 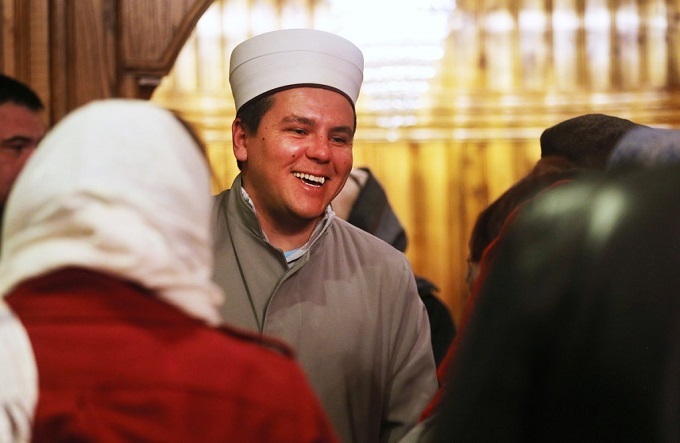 In the historic Bosnian city of Mostar, which was once even divided, between Bosniak and Croat sections, a couple of Catholic nuns and hijabi Muslimah were pictured together in friendly chatting. A few years ago in Sarajevo, a nice interfaith gesture went almost unnoticed by most of the media. A group of Franciscan theology students invited Muslim students from the Faculty of Islamic Studies to be their guest lecturers for the presentation of the spiritual and universal heritage of the famous 13th century spiritual poet and theologian Maulana Jalaluddin Rumi and St. Francis, since both of whom are known for their timeless, global messages of moral and peace. After talks and lectures, Muslim students realized it was time for their evening Maghreb prayer. As they tried to leave for the mosque, their Franciscan hosts told them they had already prepared a room for them to pray, since it takes a while to get to the nearest mosque by walking. Muslim students accepted this kind offer and performed a prayer in one of the Franciscan theology building’s rooms, with the qiblah direction already marked. In southern Bosnia, the small but picturesque town of Stolac went through horrible times in the last war(s). It was devastated by the Croatian army, but the town is gradually recovering. Stolac has one popular Sephardic Jewish tomb dedicated to one prominent Bosnian rabbi from the early 19th century by the Gregorian calendar. There are no registered Jews in Stolac today, so the shrine is being visited from time to time by Hebrew scholars from the cities like Mostar and Sarajevo, several hours away from this spot. The shrine was partly vandalized by hooligans but it survived thanks to the Muslim family whose house is in the neighborhood. This Jewish tomb is being cleaned, fixed and maintained by this Muslim family a couple of times a week, for years. We should use these examples for the removal of a black and white view of the various faiths. Even in the time of the Prophet Muhammad (ﷺ) there were cases when persons who hated either him or the Muslims in general, would at some point turn toward Islam without being forced to. That means patience still works. No matter how a person, institution, organization, country, nationalism, tribalism or ideology looks anti-Islamic or full of hatred, things are never totally as they appear on the surface. Plus, it changes from within, as believers should figure out from these examples and many others.